This World Cup is being praised as one of the most thrilling in the tournament's history and it has the numbers to prove it. Long-standing records - for goals, ages and even the length of names - are all tumbling in Brazil. Here, we pick five of the most notable record breakers at Brazil 2014. This has been a landmark event for social media, with Twitter and Facebook both registering record numbers of interactions. A record 16.4 million tweets were sent during Brazil's victory on penalties over Chile, including 388,985 tweets during the final moments of the dramatic penalty shoot-out when Chile's Gonzalo Jara missed the decisive spot-kick - making it the most tweeted-about event in the history of social media. That number broke the record set during the 2014 Super Bowl when 382,000 tweets were sent per minute and also topped US election night 2012 - 327,452 tweets. Facebook also hosted a record one billion interactions for the first time in its 10-year history during this year's World Cup. Judged by the number of goals, this World Cup has been one of the most entertaining ever, with a record 136 scored in the group stage. That was six more than in South Korea and Japan in 2002, which held the previous record. And the trend has continued into the knockout stage, with Paul Pogba's header against Nigeria registering goal number 146 - one more than the total scored during the whole tournament in South Africa in 2010, which saw the lowest goal return since the tournament moved to a 64-game format. 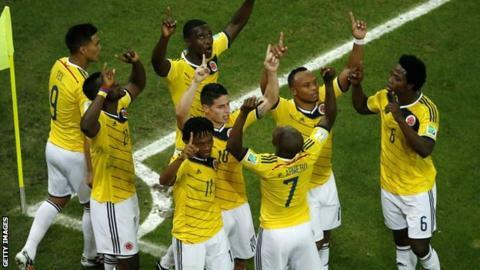 Colombia are enjoying their best performance at a World Cup, winning all four of their games so far and progressing to the quarter-finals for the first time in their history. They now also have the oldest player in World Cup history in their ranks, after 43-year-old goalkeeper Faryd Mondragon beat Roger Milla's previous record, set in the 1994 tournament, when the Cameroonian striker was 42. Mondragon appeared as a substitute in a 4-1 win over Japan, three days after celebrating his birthday. It was his first competitive appearance for his country since 2005. Greece may have suffered a heartbreaking exit on penalties at the hands of Costa Rica, but they left Brazil with one of their players having claimed the coveted title of longest single World Cup goalscorer's surname. Sokratis Papastathopoulos took that honour when he scored a dramatic late equaliser against the Costa Ricans to send the tie into extra time. His was not the only record-breaking name at this tournament, however, after Brazil striker Jo became the player with the shortest name to make a World Cup finals appearance. Ghana may have suffered a disappointing exit at the group stage in a campaign that was also marred by a bonus row and indiscipline, but there was one silver lining for the Black Stars, as striker Asamoah Gyan became the leading African goalscorer in World Cup history. Gyan's strike in Ghana's 2-1 defeat by Portugal brought his total World Cup tally to six. The 28-year-old had already become the first African to score in three World Cup finals, after he netted against Germany in Ghana's previous Group G fixture, and his sixth goal saw him overtake the previous African record of five, set by Milla - making it a bad World Cup for the Cameroonian all round.